The long-awaited South Asian Free Trade Area (SAFTA), paving way for free trade of goods among countries of the region, came into being today but Pakistan was yet to complete the formality of ratifying it. Pakistan and India today exchanged lists of nuclear installations under a special agreement that prohibits Islamabad and New Delhi from attacking each other's nuclear facilities. A woman and her five children were burnt alive by some persons at Raghopur in Vaishali district in the wee hours today for apparently refusing to withdraw a complaint of theft. Do you feel that crime rate has significantly decreased in Punjab? Should there be “one rank, one pension” for defence personnel? This is the third instalment of readers’ response. 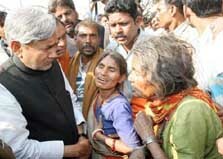 Bihar Chief Minister Nitish Kumar today ordered a high-level inquiry into the arson incident at Ram Shyamchand village in Vaishali district last night, in which six members of a family, were burnt alive. After visiting the spot, Mr Kumar said a high-level inquiry into the incident. A married woman, aged about 23 years, was allegedly picked up from the market area in Narela and gang-raped by two unknown persons in a moving car. This was the fourth such incident during last six months. 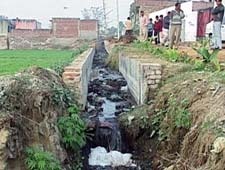 Chemically treated discharge from tanneries at Ramdaspura Mohalla in Nangal village, near here, has been playing havoc with the lives of humans and livestock for the past many years. There were no internal differences in the party in the past. Nor there will be in the future. Winston Churchill, Britain’s Prime Minister during World War II who had described Mahatma Gandhi as a “half naked fakir,” was ready to let him die in prison if he went on hunger strike, while interned during the war, archives released here today showed. Gandhi was held for two years at the Aga Khan’s Palace in Pune, from August 1942 after slamming India’s involvement in the war and calling for the Civil Disobedience movement.